Guests at many hotels either love or loath the mattresses in their rooms. We at HotelPillow.com are constantly asked if we stock or plan on carrying mattresses and we always answer that we are considering it, but in the meantime we suggest either a quality featherbed or the premium comfort of the Restful Nights ® Topper found at Many Hampton Inns ®. 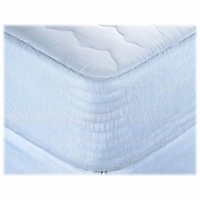 This Topper adds a few inches of comfort to the top of any mattress, making an existing bed feel brand new. The 100% polyester filling is allergen free and the generous elastic banding means a secure fit. See what keeps many Hampton Inn ® guests on cloud nine with the Restful Nights ® Synthetic Pillow Top Mattress Cover and improve your bed without the cost of a new mattress!